Bumpers that move with the trailer! Premature wear on the face of the bumper is prevented with Nytrex™ Sliders because the Nytrex™ core moves up and down with the action of the trailer. 4 times the life of a normal bumper! Protect overhead door tracks from accidental impact and reduce maintenance costs. 45° angle flange adds strength, protects from side impact. 7-gauge steel construction, powder coated safety yellow for high visibility. 1/4” foot plate drilled with slotted holes for three 1/2” anchors. Wall flange drilled with slotted holes for four 3/8” anchors. Available in 24”, 36”, and 48” tall sections. Bumpers that move with the trailer! Premature wear on the face of the bumper is prevented with Nytrex™ Sliders because the Nytrex™ core moves up and down with the action of the trailer. 2 times the life of a normal bumper! With its powerful and reliable ½ HP AC motor, this operator is a real performance workhorse. It is an ideal choice for homeowners who value enhanced security and dependability. The power and performance to last a lifetime along with more lighting and control makes it a valuable upgrade. Enjoy the quiet confidence of the reliable DC motor. The smooth and quiet motor makes it an ideal choice for home owners with a bedroom above the garage. Our most powerful DC motor provides added power to lift heavier doors. Guardian's standard 2-button remote will give you the option to control up to 2 Guardian garage door operators. Guardian remotes are engineered and designed for minimum power consumption to ensure long lasting battery life. For those seeking more style, the LED backlight lets you know that the digital signal has been sent. Put the power of controlling up to 3 Guardian garage door motors at your fingertips. The premium remote is ideal for those who need access to several garage doors with one device. Stylish enough to show off and small enough to fit in your pocket, equipped with back-lit LED for your convenience, bring elegance to your garage door opener with this compact key chain friendly remote. The traditional but unique design can attach to your visor with the handy visor clip. The dip-switch control of one of the buttons makes this a perfect remote for gated communities. Control a gate or up to 4 guardian garage door openers. Designed for outdoor installation and completely weatherproof, this wireless and keyless entry keypad grants quick and secure access to multiple garage door operators without the use of a remote. Bluetooth speakers are integrated into a quiet and smooth running garage door opener. It's a garage door opener, music system and speakerphone all built into one. It is ideal for homeowners who spend a lot of time working or entertaining in their garage. Resilient Sound Isolation DeCouple Clip used decoupling of wall systems, isolating ceilings, and mechanical vibration control. The MD-CM Series edge-of-dock leveler from Blue Giant is ideally suited for applications where installation of pit levelers is not feasible or where standard fleet bed heights are serviced at the loading dock. It is a versatile, reflective photo eye, specifically designed to address the challenges of the door industry. It is virtually impact resistant due to its heavy-duty housing, while it requires much less wiring because of its single-sided photo eye design. Heavy-Duty Gear Head jackshaft operator. These operators are overstock and priced to move! Imagine your Customers receiving an alert if they left their garage open. Or being able to turn on their lights when they’re not home. The LiftMaster® 821LM MyQ Garage does this by letting your Customers monitor, open and close their garage door from anywhere and control home lighting…all from their smartphone, tablet or computer. 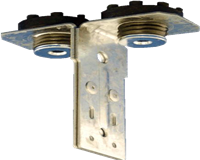 Designed for use on commercial or industrial sectional overhead doors with standard lift tracks.